For the former sovereign state, see Tanganyika. Tanganyika was a territory administered by the United Kingdom from 1916 until 1961. The UK initially administered the territory as an occupying power with the Royal Navy and British Indian infantry seizing the territory from the Germans in 1916. From 20 July 1922, British administration was formalised by Tanganyika being created a British League of Nations mandate. From 1946, it was administered by the UK as a United Nations trust territory. Before the end of World War I, the territory was part of the German colony of German East Africa (GEA). After the war started, the British invaded GEA but were unable to defeat the German army. The German leader in the African Great Lakes, Paul Emil von Lettow-Vorbeck, did not surrender until notified about the Armistice of 11 November 1918 that ended the war. After this, the League of Nations formalised the UK's control of the area, who renamed it "Tanganyika". The UK held Tanganyika as a League of Nations mandate until the end of World War II after which it was held as a United Nations trust territory. In 1961, Tanganyika gained its independence from the UK as Tanganyika. It became a republic a year later. Tanganyika now forms part of the modern-day sovereign state of Tanzania. The name "Tanganyika" is derived from the Swahili words tanga ("sail") and nyika ("uninhabited plain", "wilderness"). It might, therefore, be understood as a description of using Lake Tanganyika: "sail in the wilderness". In the second half of the 19th century, European explorers and colonialists traveled through the African interior from Zanzibar. In 1885, the German Empire declared its intent to establish a protectorate in the area, named German East Africa (GEA), under the leadership of Carl Peters. When the Sultan of Zanzibar objected, German warships threatened to bombard his palace. Britain and Germany then agreed to divide the mainland into spheres of influence, and the Sultan was forced to acquiesce. The Germans brutally repressed the Maji Maji Rebellion of 1905. The Germans instituted an educational programme for native Africans, including elementary, secondary, and vocational schools. After the defeat of Germany during World War I, GEA was divided among the victorious powers under the Treaty of Versailles. 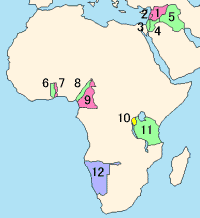 Apart from Rwanda and Burundi (assigned to Belgium) and the small Kionga Triangle (assigned to Portuguese Mozambique), the territory was transferred to British control. "Tanganyika" was adopted by the British as the name for its part of the former German East Africa. In 1927, Tanganyika entered the Customs Union of the East Africa Protectorate and the Uganda Protectorate, which eventually became the independent countries of Kenya and Uganda, and the East African Postal Union, later the East African Posts and Telecommunications Administration. Cooperation expanded with those protectorates and, later, countries in a number of ways, leading to the establishment of the East African High Commission (1948–1961) and the East African Common Services Organisation (1961–1967), forerunners of the East African Community. The country held its first elections in 1958 and 1959. The following year it was granted internal self-government and fresh elections were held. Both elections were won by the Tanganyika African National Union, which led the country to independence in December 1961. The following year a presidential election was held, with TANU leader Julius Nyerere emerging victorious. ^ UK Government publication: "Mandated Territories" and "Trust Territories"
^ John Knouse: A Political World Gazetteer: Africa Archived 2011-06-10 at the Wayback Machine website accessed 1 May 2007. ^ East, John William. "The German Administration in East Africa: A Select Annotated Bibliography of the German Colonial Administration in Tanganyika, Rwanda and Burundi from 1884 to 1918." [London? 1989] 294 leaves. 1 reel of microfilm (negative.) Thesis submitted for the fellowship of the Library Association, London, November 1987." Iliffe, John. A modern history of Tanganyika. Cambridge: Cambridge University Press. ISBN 9780521296113. Gordon-Brown, A. (editor), The East Africa Year Book and Guide, London, 1954, 87pps, with maps. Hill, J.F.R., and Moffett, J.P., Tanganyika – a Review of its Resources and their Development, published by the Government of Tanganyika, 1955, 924pps, with many maps. Mwakikagile, Godfrey, Life in Tanganyika in The Fifties, New Africa Press, 2008, 428pps, with maps and photos. Moffett, J.P., Handbook of Tanganyika, published by the Government of Tanganyika, 1958, 703pps, with maps.